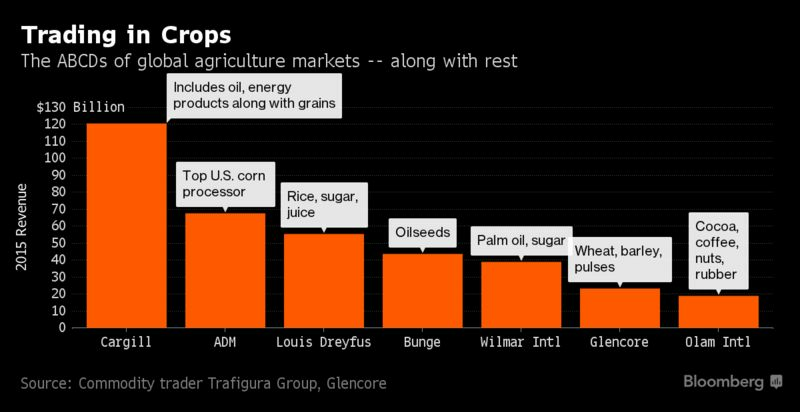 The era of excess in agriculture is squeezing traders dry. Years of bumper grain harvests, coupled with low prices and diminished volatility in many markets, are making it tougher for the world’s biggest agriculture companies to make money buying and selling major crops like wheat, corn and soybeans. Now, firms including U.S. processor Archer-Daniels-Midlands Co. and Chinese food giant Cofco Corp. are restructuring or scaling back their ambitions. During the commodity boom years, the industry thrived on price swings and expanded in a bet that profit would increase as population growth drove food demand. But after record-breaking production by top exporters like the U.S., Russia and Argentina, many markets are mired in surplus. Companies that operate vast global supply networks that deliver crops from farms to food makers now find themselves in a buyer’s market. “When commodity prices are high, you generally have a high level of volatility and traders thrive," said Philippe Chalmin, a professor of economic history at University Paris-Dauphine. "When markets are like they are today -- very flat, very dull, without much volatility -- there are far fewer opportunities for traders to earn a living." For companies focused on merchant trading, the pain is acute. Closely held Louis Dreyfus Co. reported its lowest profit in a decade last year. To raise cash, the Rotterdam-based company sold 400 million euros ($426 million) of bonds last month. It also agreed to sell a stake in a Brazilian joint venture to a Japanese farming group for $250 million, according to people familiar with the transaction. Chicago-based ADM revealed Tuesday that “poor execution” led to a fourth-quarter loss -- the second in the space of a year -- at its international trading desk. That followed a series of high-profile departures in the past few months, including Victor Petzold, the company’s former head of global corn, and Frederik Groth, head of trading in Asia. David Driscoll, an analyst at Citigroup Inc. in New York, said ADM “should bounce back nicely” in 2017 as profit improves from oilseed processing, increased movement of huge crops through its storage terminals and better demand for corn sweeteners. Earnings per share, excluding some items, will jump by almost a third this year, according to the average estimates of 16 analysts surveyed by Bloomberg. Cargill Inc., owned by the same family that founded it 152 years ago, reported a rare quarterly loss in the three months through May 31, partly because of wrong-way bets in soybean markets. Since then, earnings have improved, partly because the Minneapolis-based company has non-crop businesses including petroleum, metals, animal nutrition and meat processing. Cofco, which went on an international buying spree in recent years, is refocusing on the domestic market in China. Nidera BV, the Dutch grains trader Cofco acquired, disclosed last year a $200 million loss in unauthorized biofuels deals and recently found a $150 million hole in its Brazilian accounts. The agriculture unit Cofco bought from Noble Group Ltd. faced headwinds as the Hong-Kong-based trader suffered an attack from short-sellers. Stagnant prices are a big reason for the swoon in trading. Traders usually prosper in volatile markets and can earn bigger profits buying and selling futures than moving physical commodities. In this business, the more obscure the market, the better the prospects, because big companies with vast networks tend to be more aware of possible disruptions or changes in supply. That kind of information creates an advantage in finding profitable trades that exploit price differences between regions, a strategy known as arbitrage. But as grain supply boomed over the past decade, big price swings became more limited. In just four years, global wheat stockpiles have increased 42 percent to a record 253 million metric tons, according to data from the U.S. Department of Agriculture. Over the same period, corn inventories surged 66 percent. Prices for both grains have dropped for four straight years. The 60-day historical volatility for the Bloomberg Agriculture Subindex -- which tracks futures contracts for eight commodities including wheat, corn and soybeans -- has fallen by more than 70 percent since its 2008 peak. The gauge added 0.2 percent on Friday. Benefiting from arbitrage has also become harder. With social media tools such as Twitter, public information travels faster and more people can learn about weather disruptions, supply backlogs and other details that big trading houses often got first because of their close links with farmers. Smaller profit margins are also hurting regional traders. Union InVivo, France’s biggest wheat exporter, plans to reduce staffing at its trading unit by almost a third after a disastrous harvest. German grain and oilseed trader BayWa AG also shrank its Dutch export unit to focus on the company’s biggest markets. Globalization and new technologies mean markets are increasingly transparent, so producers and processors can tap international markets directly -- exporting, importing and trading for their own hedging needs, Jean-Philippe Everling, the chief executive officer of French trading company TransGrain, said in an interview at Paris Grain Day on Jan. 27.